Other nerdy/sci-comm people's takes on the eclipse. Just in case my own nerdy take wasn't enough for you: I'm going to gather here just a few links to eclipse reactions from minor celebrities in the world of science communications (that's what I mean by sci-comm, of course). If I come across more, I might add more. Derek Mueller runs Veritasium, "a channel of science and engineering videos featuring experiments, expert interviews, cool demos, and discussions with the public about everything science." "Particles line up. Big deal." Here's the Veritasium episode that he filmed during the eclipse. Still no big deal? My kids (and I) are big fans of Smarter Every Day, which is produced by Destin Sandlin. Sandlin's best work involves high-speed videography, of things like jellyfish stings and exploding glass drops. Clearly, Sandlin didn't have the "no big deal" attitude, but he still wound up more excited than he expected. Along with photographer Trevor Mahlmann, he traveled to the only location in the U. S. where it was possible to watch the transit of the International Space Station across the sun at the same time as the eclipse. Here's his video -- in which it is revealed that this extraordinarily precise camaraman was so blown away, he forgot to remove some of his lens caps. I watched from a beautiful nature reserve in central Missouri, and it was--without exaggeration--the coolest thing I've ever seen. I wasn't far away, and I agree. In March I suggested to Mark that we get a hotel reservation for August 20, 2017, in the path of totality somewhere, because I had heard that hotels were filling up. Within a couple of days he had gone online, searched, easily found a couple of rooms in a motel northeast of Kansas City for $80 each, and reserved them without fanfare. I think he may even have laughed at me a little for worrying that there would be nearly no rooms left, although he did warn me that they were not nonsmoking rooms. When we checked into that motel Sunday night, the clerk informed Mark that those rooms had only come available as a result of a computer glitch that incidentally left them underpriced for a two-day window, during which Mark had happened to log on. That had been the start of our luck. I was worried about disappointing everyone, about dragging the family down to Missouri only to see a cloudy sky; about thirteen hours of driving round-trip for a two-minute experience. I was also worried about being trapped in a gigantic national traffic jam. I was following people on Twitter who had made three, four, six lodging reservations spaced along hundreds of miles of the eclipse path. I knew people who would be in Tennessee, South Carolina, Wyoming. Two weeks out I started watching the projected "sky cover" forecasts. The center of the country did not look good. But that was where our reservation was, so we would go there anyway and hope for the best. "Maybe," Mark suggested, "we can get up in the morning, check the forecast, and drive to get away from the clouds." I fretted, and I packed the car with 36 hours' worth of food and water. When I was a very small child I owned a paperback picture book called "Something is Eating the Sun." I think I remember choosing it at Books & Co. in my hometown. It was a riff on Chicken Little, a series of barnyard animals becoming increasingly worried about the bites being taken out of the sun's disk, page by page. The last page warned readers against following the animals' example and looking directly at the sun during an eclipse. When I was a bigger child (almost certainly on July 6, 1982, when I was seven) there was a total lunar eclipse visible from my street. I remember being allowed to stand outside barefoot in the street after my bedtime. I don't remember what it looked like, but I vaguely remember being disappointed that it did not look like something was eating it. I got older, and I learned about the solar system and the law of gravitation, Kepler's laws, the mathematics of ellipses, a bit of astronomy. I learned about how the Royal Society made observations during the eclipse of May 29, 1919 that tested the theory of general relativity. Total solar eclipses were a thing in the planetary domain that I had never seen but that I understood, the way I understood that the moon made the tides. I had studied ebb and flow, neap tide and spring tide, the lag behind the moon and the slowing of the earth's rotation. I had eventually been to the seashore and seen the water rise and fall, the moon's work between my feet and flowing cold around my ankles. Someday, I might see a total eclipse too. I was a sophomore at Ohio State when I saw a partial phase of the annular eclipse of May 10, 1994. The square courtyard between McPherson Lab and Smith Lab was full of people trying to look at the sun through Pop-tart wrappers and CDs. I had no light filter and knew better than to look at the sun, but I could feel the temperature drop and see the strangeness of the light. I stopped to sit down next to some shrubbery; its shadow was spangled with perfectly identical crescents of light, an unexpected phenomenon that delighted me, none the less because I recognized the pinhole effect immediately even though I did not know to look for it until that moment. No one around me had noticed the shrubbery shadow yet, and it felt for a moment like a private secret between me and the universe. That got me a little more interested. And when I encountered Annie Dillard's essay "Total Eclipse," much later, I began to think seriously: If I get a chance to experience an eclipse, I shouldn't miss it. All this is to say that I knew what would happen. I knew, too, that other people knew even better than me. I know in the bottom of my being that the planets and the moons move in their elliptical orbits so simply and in accord with laws that are themselves so simple, that the locations and times of all the eclipses for hundreds of years in the future have already been mapped; so simple that indeed people have been predicting them for hundreds of years, before computers, before calculators, before pencils. Eclipses are a tame thing, a trivia question, a child's picture book, a just-so story. They may be rare, but they are a caged specimen. A famous gem of the natural world. I knew everything about them. I was even well informed, thanks to Annie Dillard, that they were an emotionally moving experience that was worth driving a few hours to see. I get it, I get it; we'll go. I knew it would be cool. Rain poured and lightning flashed in the morning in Kansas City. We checked out of our hotel at 11 am and ran through the rain into a McDonald's, where patrons were watching the crescent sun on big screen teevees, a feed from the west coast where the eclipse had already started. One hour and forty-five minutes to totality. The parking lot was flooding and the sky was leaden. "At least we got to eat Kansas City barbecue last night," I was saying. I was tense. I had dragged the whole family down here for nothing. Mark said: "We'll check the weather radar and drive towards clear skies." I said: "There will be traffic jams. Maybe we had better stay put and hope that the rain passes." Mark grinned at me and said: "You know what this is? This is an adventure. This is a weather-dependent activity. I do these all the time." And in that moment, I realized that whether we saw the sun or not, it was going to be okay. Fifteen minutes later we were in the car. Mark was driving fifty miles an hour in the pouring rain, twisting left and right between fields of tall corn, and I had a phone in each hand: one displaying the static, zoomable map of the totality path, and one tracking our little pulsing blue circle along the back roads northeast of Kansas City. "Does this road go east?" Mark was saying. "The skies are clearer to the south, but the car says it's going east." One hour and twelve minutes to totality. "It goes southeast," I repeated through the thunder of the rain on the roof of the car. "The car is going east--"
"It zigzags. On average, it's southeast. We have to stay on this road to cross the river." Our oldest, from the back seat, with a third phone open to live weather radar: "After we cross the river we need to cut west." "West! After we cross the river." There was a patch of blue sky, and Mark made for it. Amazingly, there were not a large number of cars on the road with us. We came out of the rain. "Look, there's space at this crossroads." And then we passed a little driveway into a pasture, with a little chained gate a few yards from the road, and a pond on the other side of the gate, and Mark said: "That's where I'm going to stop. He pulled into the driveway of a bed and breakfast that was the next mailbox down, turned around, and went back to the little driveway and pulled in. We set up telescopes, and pulled out our eclipse glasses embedded in paper plates for safety, and I looked up at the crescent sun and I realized that it was really going to happen. The children were positively leaping. We put the three-year-old in the van for safety's sake, partly so he would not look at the sun, but mostly so he would not wander into the road. And we looked up, and stopped taking photos, and waited. We felt it get cooler. We saw the light going all wrong, and I saw Mark laughing: "This light is crazy!" "It's like a tornado sky," said my daughter. I agreed, it was like that. The crickets began to sing. The children exclaimed over the shadow bands rippling in the road. I stood next to the van door so that I could keep some attention on the three-year-old. I watched the crescent get smaller through the eclipse glasses. This was so interesting that I forgot to look around at the deepening sky, or look to see the great shadow coming. I watched through the eclipse glasses until the light was completely gone and the children started shrieking. Then I looked. I staggered backward, two, three, steps, staring at the sky. I'm not sure if I was recoiling, or backing up to try to take it all in -- either way, something crazy that couldn't make sense, because there is no way to get farther from the sky. "Oh, my God," I was saying, over and over again. Yes, I could see the corona, ghostly in the blackness, and Venus down and to the right. Yes, I could see the ruby-colored sparkles around the black disk of the moon. Yes, it was beautiful. I know some people say that it was like a religious experience. It was not like that for me. A religious experience is a sense of communing with the supernatural. I am kind of familiar with those, oddly enough. This was new. It was a natural experience. And it was making tears well out of my eyes. "Oh, my God," I kept saying. My 13-year-old son kissed me on the cheek. I became aware of someone standing close behind me, grasping my bare upper arms in his warm hands. I remember deciding that it was probably Mark, but I could not tear my eyes away from the moon and the sun. The first thing I came up with to try to explain the experience was: Have you ever seen videos of audiences from the Beatles' tour of the U. S. in 1964? The young women weeping and dropping to their knees upon catching sight of the stars? I always wondered what on earth would make people act like this. 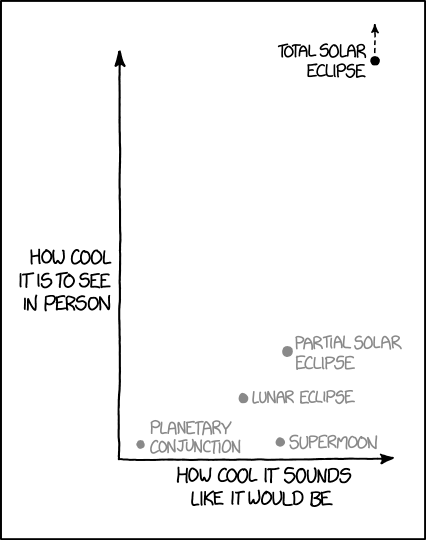 But having seen the eclipse, I think it was a little bit like that, an extremely nerdy celebrity sighting. I am a science nerd. It is essential to my being. Total solar eclipses are celebrities, rare celebrities, a thing that I thought was tame but that has tamed me, apprivoisé, a thing I know like an old friend, like Fibonacci's sequence, like the digits of pi, like the hydrogen atom. And there it was right in front of me! A thing I'd hoped to see for my whole life, but not ever allowed myself to long for, because maybe I would never attain it. And now I was face to face with it, and I knew -- knew -- it was something worth longing for. Had always been. And I was, in fact, weeping at the sight, and my knees really were weak. You can study the biology of human gestation for your whole life, become an expert, do original research, earn a medical degree, a Ph. D., see patients, weigh evidence, make predictions, feel the satisfaction of measuring the outcomes and watching them come true. Knowledge is valuable. And yet: it is not a substitute, never can be a substitute, for bringing your own child to birth. It's not the same. You can know everything that's going to happen, and everything can progress exactly as you expect, and then experience knocks you back, with something you didn't even know was there, something beyond knowledge, something that ties you to every other human on the planet who has ever experienced the thing, and forever separates you from those who haven't. And they don't know either, any more than you did, in the time before. The second thing I came up with to describe the experience was: It was less like an event than it was like a feature, like the mountains and the sea are features of our planet, but this is a feature of the solar system instead, the first feature I ever really got to see. Oddly enough, the starry night sky seems also to be a feature of our planet; even though it is located outside the planet, it looks the same all the time; we can look in different directions from here, but the view is essentially the same. The planets moving against the sky is a little like this, but you cannot really watch it happen because it is too slow. Our planet has some very beautiful features. Before Monday I often said that the most beautiful place I have ever been is the Alps above the Chamonix Valley; I said that the first time I went there when I was in college, and I said it again when I returned with my husband and five children twenty years later. I have seen and heard other beautiful features: certain birds and jellyfish, certain beaches at sunrise, certain echoes of laughter ringing in columned arcades, certain cleverly shaped and polished stones. The total solar eclipse is like that: a thing worth traveling to see, all by itself, but it's not of this earth, it's of something larger, it's of the sun and all its orbiters, including me. The limited slips of time in which it happens, well, that's just part of the directions to get there, they're simply directions that include both time and space. I will be back in the Alps very soon, and I somehow think it will no longer be the most beautiful place I have ever been. If there's one thing I perceive intellectually more than I did before, it's the tremendous gift given to us at the formation of the solar system, the gift of a moon that is, sometimes, the same size in the sky as our sun. Much larger or closer and it would cover up the corona; much smaller or farther, and we would never have totality. It did not have to be that way, and it is, for no particular reason; it just is. A gift. Everything that is beautiful is a gift, but knowing it increases its beauty. I knew that, but I know it more now, and I am truly grateful. It was over fast, and the light came back, and the shadow bands were streaming over the road, like the shadows of clouds, but impossibly fast. And we threw everything in the car and raced to beat the traffic going home on I-35. The memory of those two minutes and nine seconds is truly dreamlike; I remember the feeling, the shock, the staggering backwards, the tears, reaching my hand out to the van to steady myself. One of the strangest parts of the memory is the way I realized that Mark was standing behind me and holding me: that I hadn't even noticed him coming up to me and putting his hands on my arms, the way he seemed to came out of nowhere, the way I had become aware of that sensation without really being aware of what it meant, or who he was, or thinking, really, about anything at all. Astonishment. Pure astonishment, and a sight, and even now I can barely remember the sight, but in a breath I can remember the way the astonishment took hold of me. I can relive it, sometimes, not by watching videos of the sun disappearing, but by hearing audio of the crowds gasping and stammering, the way I gasped and stammered. Will it happen again, if I travel to see another one? I don't know. I will find out, I hope, in 2024. ... I am about to turn in all my school reports. And I have made a detailed book list for the fall. And two friends were chatting away about bullet journaling (which turns out not to be at all what I imagined). And then Bearing Blog wrote about how she divvies up her time and keeps her mental health always in view. (Oh how I love Bearing Blog and her calm, rational way of thinking.) And it reminded me that, when I’m in the thick of a school year, I do get into an ugly, constraining loop of not being able to stop working. So, obviously, as per usual, of course, necessarily, as I vow every year, I don’t want to do this again. I want to find The Perfect Organizational System that will remove entirely the existential gaping maw of failure. Because, of course, if I just do all the work, I won’t fail. Right. I mean, that’s what it comes down to. It’s me just working hard enough and not forgetting anything that is the difference between life and death. I was going to leave a comment at Anne's blog along the lines of "You really should say, 'Bearing Blog wrote about how she TRIES to keep her mental health always in view,'" but then I remembered my own advice to myself in the linked blog post, the one where I resolved to blog before I get any work done or do anything else. Well, there was more to it than that, but anyway, I should blog before I write the key to the chemistry test, and if I leave the comment at her blog first, my thought will be spent. At any rate, today I want to share a post from the excellent physics blog, Gravity and Levity. Momentary digression. I first started blogging in 2005, not quite a year after I finished my Ph.D. in chemical engineering. It was probably right about the time that I was deciding to hang up the idea of switching to technical editing and developing a free-lance network. And I hadn't yet gotten to the place where I would accept that I wasn't ever going to get around to cutting and polishing the three publishable pieces of my thesis and shopping them to the appropriate journals, a place of acceptance that I wouldn't finally reach until my academic adviser passed away about two years later. At the time, I thought that I might do quite a lot of science blogging, in between the recipes and the self-help, commentary on news articles and the like, and so I read some science blogs. But as time went on, I got bored with all but a few. It turns out that I don't have time to write commentary on all the Science News that passes by the world's eyes day after day, shining for a moment, inspiring a burst of chatter, then passing back into oblivion. Identifying non-science (e.g., engineering, technology, and nature-education) as "science"
Identifying the policy opinions of a person who is employed as a scientist as "science"
Ascribing magical certainty to anything called "science"
There's also the problem of specialization. I only studied in depth one little tiny area in materials science and engineering. I can't comment with a post-graduate level of expertise on anything else, except for the general skills that one develops along the way (mostly math and procedure). Anyway, the gist of that is that I don't read many science blogs anymore. I do read some scientists' blogs, though, because people who write generally and well and bring their perspective as a complete nerd to whatever interests them are the people I like to hang out with, virtually speaking. So, back to Brian's recent post at Gravity and Levity, Toward a Culture of Tolerating Ignorance. He begins with some words about impostor syndrome, and then dives into the practical advice, which I'll quote at length. As a young (or even old) scientist, you continually feel embarrassed by the huge weight of things you don’t know or don’t understand. Taking place all around you, among your colleagues, superiors, and even your students, are conversations about technical topics and ideas that you don’t understand or never learned. And you will likely feel ashamed of your lack of knowledge. You will experience some element of feeling like a fraud, like someone who hasn’t studied hard enough or learned quickly enough. You will compare yourself, internally, to the sharpest minds around you, and you will wonder how you were allowed to have the same profession as them. These kinds of feelings can kill you, and you need to find a way of dealing with them. I have found that the best strategy is to free yourself to openly admit your ignorance. Embrace the idea that all of us are awash in embarrassing levels of ignorance, and the quickest way to improve the situation is to admit your ignorance and find someone to teach you. In particular, when some discussion is going on about a topic that you don’t understand, you should feel free to just admit that you don’t understand and ask someone to explain it to you. Admit that you, also, don’t understand it very well. Explain the topic as best as you can. Most commonly, your response will be some combination of 1 and 2. You will be able to explain some parts of the idea, and you will have to admit that there are other parts that you don’t understand well enough to explain. But between the two of you (or, even better, a larger group) you will quickly start filling in the gaps in each others’ knowledge. A culture where these kinds of discussions can take place is a truly wonderful thing to be a part of. In such an environment you feel accepted and enthusiastic, and you feel yourself learning and improving very quickly. It is also common for creative or insightful ideas to be generated in these kinds of discussions. To me, a culture of tolerating ignorance is almost essential for enjoying my job as a scientist. The enemies of this kind of ideal culture are shame and scorn. The absolute worst way to respond to someone’s profession (or demonstration) of ignorance is to act incredulous that the person doesn’t know the idea already, and to assert that the question is obvious, trivial, and should have been learned a long time ago. (And, of course, someone who responds this way almost never goes on to give a useful explanation.) An environment where people respond this way is completely toxic to scientific work, and it is, sadly, very common. My suggestion if you find yourself in such an environment to avoid the people who produce it, and to instead seek out the company of people with whom you can maintain enthusiastic and non-scornful conversations. Of course, I have two general responses to Brian's post, which you should really go read in its entirety (if only so you can follow the embedded links -- they are also very good -- and read some of the comments). The first response is the almost obligatory, "I wish I had read and assimilated this before I started graduate school." The second response is that one does not have to be working in academia to put this advice into practice. Almost any collaborative community in which you find yourself is one in which people have varying levels of knowledge of the subjects at hand. You can use it at work, in your volunteer groups, in your teams, and in your family. Ask questions. Honor questioning. The higher your position, the greater your responsibility. Answer questions. Eliminate scorn. There are so many things I didn't have figured out when I was starting out, things I realize now that I wish I could have known then. It was true about my brief time in academia, and it's true about my longer life making a home and raising children. But that's the nature of living in time: you get wiser as you go, and logically that means you must have started out pretty green. Embracing that logic really does relieve a lot of stress. But that, too, is the sort of thing you get better at with practice. Why it's important for science teachers to teach theories that aren't "true." At Gravity and Levity, a defense of teaching the Bohr model of the atom (at least as a prerequisite to teaching more modern models). The Bohr model has been discredited, but it's still very useful. A few years ago, at a big physics conference, I was party to an argument about whether we should be teaching the Bohr model of the atom in lower-level physics classes. The argument in favor was that the Bohr model is easy to teach and gives a simple way to think about the structure of atoms. The argument against was that the Bohr model is completely outdated, conceptually inaccurate, and has long been superseded by a more correct theory. The major statement of the opposition argument was that it doesn’t do anyone much good to learn an idea that’s wrong. How strongly I disagree with that statement! Science, as I see it, is not really a business of figuring out what’s true. As a scientist, it is best to take the perspective that no scientific theory, model, or idea is really “true.” A theory is just a collection of ideas that can stick in the human mind as a useful way of imagining the natural world. It is undeniable at this point that the Bohr model is decidedly not true. But, as I hope I have shown, it is undoubtedly very useful for scientific thinking. And that alone justifies its presence in scientific curricula. I would like to add that it's pretty impossible to understand what makes a revolutionary idea (like quantum physics) revolutionary, unless one has some concept of what came before. You don't have to overdo it. Article in the NYT Well Blog: Why 4 Workouts a Week May Be Better Than Six. And how about just two workouts a week? Really -- almost as good. [R]esearchers at the University of Alabama at Birmingham gathered 72 older, sedentary women, ages 60 to 74, and randomly assigned them to one of three exercise groups. One group began lifting weights once a week and performing an endurance-style workout, like jogging or bike riding, on another day. Another group lifted weights twice a week and jogged or rode an exercise bike twice a week. The final group... completed three weight-lifting and three endurance sessions, or six weekly workouts. “We think that the women in the twice-a-week and four-times-a-week groups felt more energized and physically capable” after several months of training than they had at the start of the study, says Gary Hunter, a U.A.B. professor who led the experiment. Based on conversations with the women, he says he thinks they began opting for stairs over escalators and walking for pleasure. The women working out six times a week, though, reacted very differently. “They complained to us that working out six times a week took too much time,” Dr. Hunter says. They did not report feeling fatigued....Rather, they felt pressed for time and reacted, it seems, by making choices like driving instead of walking and impatiently avoiding the stairs. I have long advised people who want to become "one of those people who works out" to start with twice a week, and try to keep that up for a good long while. I only manage three times a week myself, and that is if I am lucky and nothing derails me. Twice a week can be life-changing -- it is frequent enough to see and enjoy progress, but not enough to cause burnout. Whether it requires stressful schedule juggling depends on how full your schedule already is, and on what you are currently filling your time with. A little middle-aged motivation for you. The NYT "Well Blog" describes a study that's good news for those of us who are committed to staying fit in middle age -- or who have time to practice better habits between now and then. [W]e are spending more years living with chronic disease and ill health — not the outcome that most of us would hope for from a prolonged life span. But a notable new study published last week in Archives of Internal Medicine suggests that a little advance planning could change that prospect. Being or becoming fit in middle age, the study found, even if you haven’t previously bothered with exercise, appears to reshape the landscape of aging. Here's the deal, as best as I can figure it out: Waaaay back in 1970, a group of more than 18,000 healthy, chronic-disease-free middle-aged men and women (average age: 49) had visited a clinic for a treadmill test to determine their aerobic fitness. Then, in a first-of-its-kind data comparison, the researchers checked the same individuals’ Medicare claim records (with permission) from 1999 through 2009, by which time most of the participants were in their 70s or 80s. What they found was that those adults who had been the least fit at the time of their middle-age checkup also were the most likely to have developed any of eight serious or chronic conditions early in the aging process. These include heart disease, diabetes, Alzheimer’s, and colon or lung cancer. The adults who’d been the most fit in their 40s and 50s often developed many of the same conditions, but notably their maladies appeared significantly later in life than for the less fit. Typically, the most aerobically fit people lived with chronic illnesses in the final five years of their lives, instead of the final 10, 15 or even 20 years. (c) just beginning middle age and thinking about developing good habits. Moving from the least-fit to the second-least-fit category appears to have the strongest effect. If that's so, then going from total couch potato to not-quite-completely-a-couch-potato might make a big difference in how many years you spend as an infirm adult. The aerobic fitness level at that middle-aged checkup did not affect lifespan nearly as strongly as it affected quality of life. It "compressed" the years of infirmity. To put it bluntly, this suggests that a public health effort which managed to encourage activity in the middle age years could well pay off in long-term health care costs. Of course, this might not demonstrate a causal relationship. Even though all these adults were healthy and free of chronic disease in 1970, maybe the least-fit ones were unfit because of some underlying, deep condition that also caused them to develop chronic disease sooner than the fitter ones. Maybe a choice to become fitter wouldn't have changed that. But then again, maybe it would have. Maybe individuals who decided to become fitter would have paid more attention to the signals their body sent them, and would have detected problems earlier. Maybe a habit of exercise would have given them confidence to change other habits. Maybe getting out of the house more would have improved their mental health. We really don't know. I think this is really good news for my readers out there, most of whom are women in their childbearing years, and who don't see much concrete motivation to work on fitness habits. You've got time, folks. I would be interested in knowing more details about the age range and about how the individuals were divided into fitness quintiles, but don't have quick and easy access to the journal. Interesting article about rabies, which until recently was 100% fatal in symptomatic humans -- maybe -- and the story of the last-ditch desperate cure that seems to work -- maybe. Even though his specialty was infectious disease, Willoughby knew almost nothing about rabies. “For the board exams,” he says, “you only needed to know one thing: that it was 100 percent fatal.” He telephoned the CDC to ask if there was any treatment somewhere in the research pipeline—some promising new therapy, perhaps, not yet published in any medical journal. The CDC had nothing. Not one person had ever been shown to survive rabies without having gotten at least partial vaccination before the virus reached the brain. With less than a day to formulate a plan, Willoughby attacked the problem with quick but deliberate reading, using his limited time to review the basic neuroscience of rabies. A pretty exciting story, but one that still remains largely unconfirmed by fundamental research. The article details some of the objections that have been raised by researchers. Still, when you are dealing with "100% fatal," it becomes much more attractive to try the untested. On the same topic: I heard on NPR a week or two ago that there is a new nonfiction book out on rabies, called Rabid: A Cultural History of the World's Most Diabolical Virus. It sounded good, but I have to get in line for a copy at the library. The authors are a husband-and-wife team (he's a journalist, she's a veterinarian). I am looking forward to it, when I move to the head of the line. I am really in the mood to read something fluffy and light, which for me means "almost anything nonfiction." I just barely managed to finish Kristin Lavransdatter in time to return it to the library before it went overdue, and while I enjoyed the book, it exhausted me as epic multigenerational literature tends to do. If it were not for the patronymics I would never have been able to keep track of everyone, but at least since I always had a clue as to whose daughter or son everybody was (Kristin is Lavrans's daughter, get it? ), I didn't fall very far behind. I think I will stop here before anyone draws any conclusions about the fact that I suggested books about rabies and psychopaths as beach reads. Ahem. "In any given moment, ask yourself, do you want to be special, or do you want to connect?" As a child and adolescent, I had wanted to be special more than anything, and I was growing tired of it. More and more, I desired to make real connections. But I hadn't seen until then that specialness and connectedness are in tension, that to emphasize one is necessarily to de-emphasize the other, and that in any moment we have the opportunity to make the choice between them. Unity ... comes from letting go of the need to compare oneself to others, and choosing instead to connect through a sense of equality. I understand that, and the implied tradeoffs, much better now. I like that it is phrased as a question, because it isn't as if connectedness is always to be prized over specialness; and there's a bit of a circularity to it, because one of the things that makes each person particular -- unique -- "special" -- is the particular combination of connections he has made. One example: it's precisely because of my connections with my family members that I am irreplaceable to each of them. I am a particular person -- "Mom" -- to each of my children, the only mom they have, and my husband's only wife. Connection and "specialness" are bound up. The success of any kind of social epidemic is heavily dependent on the involvement of people with a particular and rare set of social gifts....Most of us don't have particularly broad and diverse groups of friends... In the six degrees of separation, not all degrees are equal. Social connections aren't spread out evenly. They cluster: most of us have many connections within small groups that share lots of connections. But here and there are individuals who tie those clusters together -- people who have connections to many different clusters. By necessity, having many diverse connections mean that most of the connections aren't particularly strong. (Gladwell says that such "connectors" have "mastered what sociologists call the 'weak tie,' a friendly yet casual social connection. On Gladwell's web page is reprinted a brief excerpt,"The Connectors," that introduces the concept.) But even the most highly connected people probably have a few very strong, prized connections with a few select and dear friends. At least, that seems to be true about the connectors I know. Connectors wouldn't be connectors, wouldn't tie so many people together, if they weren't willing to be "special" in the sense that in each cluster they're the one person who stands out because, well, they know so many people outside the cluster. So their numerous weak ties aren't to be disparaged: they are extremely valuable. When I stepped back from most work other than directly meeting my family's needs, it was kind of like saying to the world: I'm going to focus my energy on building a few connections, and reinforcing them heavily, rather than on making numerous connections that, because numerous, can't be strong. And that's what I do. I have the chance to carefully supervise the connections between each child and his siblings, between these children and a few close friends, between the children and my friends and my friends' children, between my friends' children and me. I have time to cultivate a few friendships of my own, too. The networks my kids and I move in are small but connection-dense. I do it this way not because I think it's better to have fewer, stronger connections than to be "well-connected" -- although I am learning to prefer it -- but because I think it's the kind of connectivity I'm better suited to help build. I'm not worried that they won't be able to branch out more later. They have time to develop a connectivity that is their own, once out of my shadow; I'm doing it for myself now, after all, at age thirty-seven, so why not they? But on second thought, I am a sort of connector, too. I work to build the connections for my family in our small cluster, but the nature of being a parent is that you are a bridge to connect your family to the outside world: a gatekeeper, if you will. It's a small connection, but to those young people, it is an artery. I think maybe the level of connection one creates is part of one's vocation, and so unique; after all, connections create responsibilities, and fulfilling these is what vocation is all about. Perhaps those "connectors" among us, tying the clusters together with a mass of weak links, have a greater impact than the rest -- at least when they work to keep the links active. A greater responsibility, even? Maybe. Here's a little story about the value of being multiply connected, and a lesson that no matter what kind of connectivity we enjoy, we always have the choice to reinforce those connections -- to send a little jolt of energy across a gap, so to speak -- and that when we do send that jolt along, it can travel quite far. A couple of days ago I wrote about calling Poison Control from camp when my child got tree sap in her eye. I was happy because they exist and because they give good advice; in a different universe where PCC did not exist or was run by lawyers, my vacation would have been ruined. I believe I wrote something along the lines of "YAY POISON CONTROL. I wish I could send you cupcakes." Count 'em, folks! Too bad I didn't ask for Champagne! But what's really great about this is the reminder that, no matter how numerous or even how weak the connections we control may be, no matter whether they are between our own family members or across town, we often get a chance to pass a little something along. It may come to nothing, or it may "merely" make someone's day more interesting, or -- who knows? It could pay back far in the future. I think I will think of this story often when those little chances make themselves known. My friend M. has been deep in the books, trying to design and redesign a good homeschooling environment for her eight-year-old son who is diagnosed with autism spectrum disorder, and who really needs quite intense attention. She is looking at various styles of teaching and how they are shown to work with real children. She came to me a few days ago saying (I'm paraphrasing): "You know what's really amazing about the so-called 'classical model of homeschooling?' So many homeschoolers put so much stock in it -- in this idea that the medieval trivium corresponds to three stages of child development -- but there isn't really any evidence for it at all! If you go tracing back the claims that people make about classical homeschooling, they all go back to just one source --"
"'The Lost Tools of Learning,'" I said. "The essay by Dorothy Sayers." "...And, well, she just made it up! She doesn't claim to know anything about how children develop. It's just her idea. But this entire industry has sprung up to support classical homeschooling, as if there was any evidence that designing a school the way she imagines it is something that really produces good outcomes. There isn't any evidence. And of course the medieval trivium wasn't at all like the homeschooling trivium that people talk about. There's no evidence that children ever were taught the way she describes." I thought for a moment how to respond. "I think that the essay provides a useful organizing principle," I ventured. "No more than that." I did have to defend myself a little bit! And I do think that the organizing principle behind "The Lost Tools of Learning" is so useful that I maintain it's part of the "homeschooler's canon" of educational philosophy. But M.'s reminder is useful, too -- that Sayers' essay is just that: an opinion piece. After all, I do go around telling other homeschoolers, when I need to, that I am "oh, sort of a classical homeschooler, with a little Charlotte Mason thrown in." Really, this is just a piece of code, shorthand for what I am not: I am not an unschooler, I am not a school-in-a-box-er, I am not entirely disorganized (I have some kind of plan), and, well, I'm not entirely "evidence-based." Let us amuse ourselves by imagining that such progressive retrogression is possible. Let us make a clean sweep of all educational authorities, and furnish ourselves with a nice little school of boys and girls whom we may experimentally equip for the intellectual conflict along lines chosen by ourselves. We will endow them with exceptionally docile parents; we will staff our school with teachers who are themselves perfectly familiar with the aims and methods of the Trivium; we will have our building and staff large enough to allow our classes to be small enough for adequate handling; and we will postulate a Board of Examiners willing and qualified to test the products we turn out. Thus prepared, we will attempt to sketch out a syllabus--a modern Trivium "with modifications" and we will see where we get to. But first: what age shall the children be? Well, if one is to educate them on novel lines, it will be better that they should have nothing to unlearn; besides, one cannot begin a good thing too early, and the Trivium is by its nature not learning, but a preparation for learning. We will, therefore, "catch 'em young," requiring of our pupils only that they shall be able to read, write, and cipher. Did you catch that bit -- that at the start of her "school" the children have already been taught to read, write, and do arithmetic? We're on our own for that part, homeschoolers. Sayers' imaginary school is not, actually, a plan (and she takes pain to point this out). Nor is it a reconstruction of the medieval trivium in any way -- significantly, she stresses, "It does not matter, for the moment, whether it [the trivium] was devised for small children or for older students, or how long people were supposed to take over it." For the sole true end of education is simply this: to teach men how to learn for themselves; and whatever instruction fails to do this is effort spent in vain. This is a philosophy that appeals to me, and it is why I go around telling people that I am a "classical homeschooler." Not because I think my homeschool should be split up into Grammar and Rhetoric and Dialectic (although I sometimes use those terms to describe the level of mental process that is engaged by a particular book or curriculum). I tell people I am a "classical homeschooler" because I believe my job is to teach my kids how to teach themselves. Which brings me to the problem of evidence-based teaching. Evidence is overrated. If I say "Evidence is overrated," you should know I am speaking tongue in cheek. I am trained as an engineer and as a scientist, and even though I abandoned that life in its early stages, its inner life has not abandoned me: I can never lose the engineer's problem-attacking method, nor the scientist's reflexes to observe, test, and revise. No, what I really mean is that the marshalled evidence often overemphasizes one kind of data to the exclusion of another kind of data that, depending on the application, may be more important. The distinction between the two kinds of data: that drawn from large groups and that drawn from individuals. Data drawn from large groups can be usefully applied to help individuals, it's true. Let's imagine an experiemental school -- would that schools would actually do this -- in which two methods for teaching arithmetic are to be evaluated. Children are randomly assigned to two classrooms, one in which the arithmetic skills are taught via method A, and one in which the teacher uses method B to teach the same skills. After a suitable time, the children are evaluated, and method A comes out ahead: perhaps more students in classroom A have achieved a certain minimum competency, or perhaps the average score of students in that classroom is significantly higher than the average in classroom B. Perhaps A outperforms B by both metrics. If the test is repeated over different schools and different populations, and if A consistently outperforms B, that would certainly be a strong argument for teaching with method A instead of method B. I would gladly support this kind of approach to curriculum selection in my local public schools, who are, after all, in the business of educating large groups. However, just because A is the better method overall does not mean it is the better method for every child in the class. Imagine there is one particular child -- let's call him Jacob -- who responds better, in a critical way, to method B. It's not that Jacob was one of the top kids in classroom B -- no, let's be honest, most of the "top kids" in classroom B would also have been "top" in classroom A, because every classroom contains at least a few kids who are going to absorb material no matter how you throw it at them. No, this boy was on the margins: Jacob was one of those who achieved competency in classroom B, did well enough. But when the classrooms all switched to the A method -- the method that was proved superior by the average-score metric and by the number-achieving-minimum-competency metric -- Jacob did not succeed, did not achieve competency. More of his classmates will succeed in the A environment, and that is good for them, and good for the school, and good for the teachers, probably. It does not help him. I am not, mind you, saying that the evidence drawn from large groups is unhelpful for the large groups. I do think schools should use data to shape their curriculum, because that is the job of the schools. I just want to point out that the schools have one job -- to teach the large groups -- and Jacob's parents have another -- to teach Jacob. This is, to me, the distinction that gives meaning to the notion that education of children is primarily the responsibility of their parents. It is reflected in Minnesota law, at least: Our state's constitution stipulates that the legislature shall establish a "general and uniform" system of public schools; "uniform" is supposed to provide for equal and fair access to schooling, and that is commendable and appropriate for government schools. The statutes specify this: "The parent of a child is primarily responsible for assuring that the child acquires knowledge and skills that are essential for effective citizenship." My point: You use large-group evidence to design approaches that are aimed at large groups. If your job is to teach Classroom B, you use what you've learned from metrics that measure Classroom B. But if your job is to teach Jacob -- and that, mind you, is not legally our state's job, nor a single classroom teacher's job, nor can it be -- it is Jacob's parents' job -- then you have to give primary weight to evidence drawn from Jacob and not to that drawn from his classmates. I derive a lot of inspiration from Dorothy Sayers' opinion piece, even though it is not evidence-based. Sayers never thought that people would try to copy the imaginary school she described, and I don't either. I follow her example -- not by trying to create in my home the school that she imagined -- but by trying to create in my home the school that I imagine. I consider the problem that life has posed me -- and I frame it and sketch it out as How will I teach my children to teach themselves? I make assumptions, I list my constraints, I weigh costs against likely benefits, I approximate when necessary, and in the end I do what I can with what I have. I make a guess -- this particular sort of curriculum will interest my eleven-year-old, or arranging the school desks in that particular way will keep my eight- and five-year-olds from fighting; I try it out; I check to see if my eleven-year-old is engaged in his work, I listen to see if the squabbles have diminished; I revise my hypothesis, I try again. There is another thing to weigh, too -- and it is sort of outside the evidence of what sort of methods produce academic excellence. Because academic achievement is not, actually, central to what I am trying to do here (although it's very easy to forget that, because academic achievement is so much more easily measured, and because the culture values it, and I am swayed by culture). What I am supposed to be doing is forming human beings who are honest, fair, kind, and wise, who have a firm understanding of their own value and of the value of other human persons, who recognize their direct responsibilities and carry them out. And no amount of evidence of academic achievement should entice me to apply a method that undermines any of these. Meanwhile, I am supposed to be forming myself in honesty, fairness, kindness, and wisdom -- and if I somehow form my children in ways that deteriorate my own character, I'm equally wrong. To put it bluntly, if by daily beatings or regular bribes I could ensure my child a perfect SAT score, that wouldn't mean I should do it. Large-group evidence based on large-group metrics will only take you so far. It isn't useless: it's just that it is useful for purposes different from mine. (I can, of course, use it for my own purposes: what's good for the group may be the best thing to try first, before tweaking to suit the individual.) This is true about education, but lots of other things too: taking care of your health, disciplining children, deciding what sort of community to live in, deciding whom to spend time with. Sometimes "what works" is what matters; other times it's far more important to find something you can live with, whether it "works" or not; most often it is a matter of balancing both. Animated scale of the universe. Speaking of the cosmos, ChristyP pointed me to this very well done, shareable-with-your-geeky-kids interactive Flash animation, and commented, "I learned some new SI prefixes from this." Check it out.